Travel to foreign lands without leaving your state–Ever wonder what Nova Scotia taste like? You soon will! Before I took the 12 hour journey to Nova Scotia I can say I knew a much about the area as I do about quantum physics. I might even admit I may know more about the physics side than this province of Canada that sticks off the east coast right near Maine. I’ll also admit I probably never would have thought to visit, or even look into the location if I wasn’t flying there to visit a brewery. This isn’t just any brewery in the area. As the craft segment grows in Canada we might be lucky enough to get a few of the beers from the north and Alexander Keith’s Brewery has decided (with a little help from AB-inBev) to bring down some of their local brews to the states. A few fellow journalists headed up to check out the breweries, meet the brewer, sample the beer and get a quick 24 hour taste of Nova Scotia. They may claim the Titanic as “their disaster” and have on record the largest pre-nuclear blast on record, but we’re hoping it’s beer that makes people stop, have a pint, and look into this small yet friendly spot just above America’s hairline. They are not creating new styles, just pointing out that these beers are born and brewed in Nova Scotia and you’ll get a little taste of what the area has to offer. The beer is not going to technically come from the main brewery in Halifax, but brewed in strategic locations around the country to feed the 22 states the three styles coming. To ensure that the beers meet the standards of the original recipes, brewmaster Graham Kendall travels to each brewery and overseas production until the taste match is 100%. Each batch is sent back and compare to the brewery standard. This is a pretty common practice in breweries that have large distribution and volume. The three styles we be able to sample are traditional styles that offer taste of Nova Scotia. Nova Scotia Style Lager (5.4%)–brewed with noble hops prized for their subtle, spicy character, and the beer features a deep amber color and a crisp finish with an assertive but clean bitterness. Nova Scotia Style Pale Ale (5.4%)– brewed with traditional two-row malt for a full, nutty flavor with a burst of fruity, spicy and citrusy hop nose. The beer features a deep golden color with a balanced bitterness. Nova Scotia Style Brown (5.4%)–a classic full-bodied brown ale, with hints of honey and caramel balanced with a fresh hop aroma provided by the addition of cascade hops. •Alexander Keith’s is launching three new beers in the U.S., including a: Nova Scotia Style Lager, Nova Scotia Style Pale Ale and Nova Scotia Style Brown Ale. •The beer’s are just now hitting store shelves in the following states, so you’ll start to see them very soon – ME, VT, NH, MA, NY, CT, RI, PA, MD, DC, DE, FL, IN, WI, MN, CO, AZ, WA, ND, St. Louis greater area (MO & IL), OR and CA. •While new to the U.S., Alexander Keith’s traces its heritage back nearly two hundred years to a small brewery in Nova Scotia. 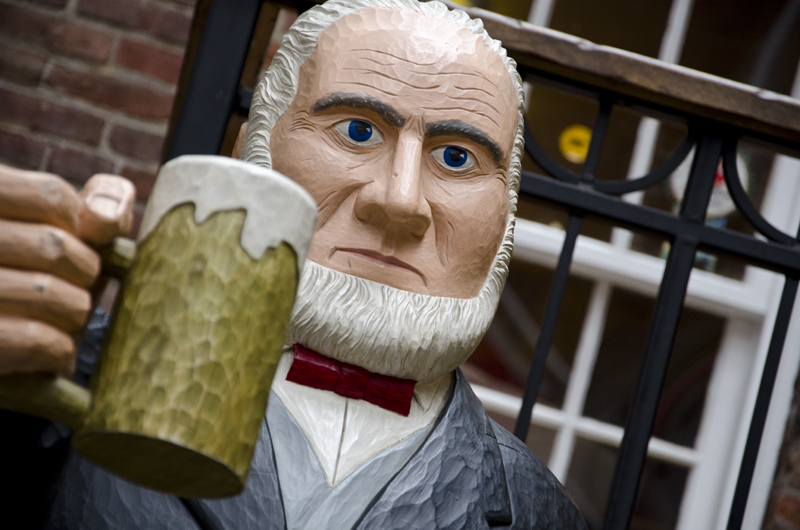 •In 1820, Alexander Keith completed his brewer’s apprenticeship and immigrated from Scotland to Nova Scotia (“New Scotland”), to launch what is now one of the oldest beer brands in North America. •Nova Scotia Style Lager is brewed with noble hops prized for their subtle, spicy character, and the beer features a deep amber color and a crisp finish with an assertive but clean bitterness. •Nova Scotia Style Pale Ale is brewed with traditional two-row malt for a full, nutty flavor with a burst of fruity, spicy and citrusy hop nose. 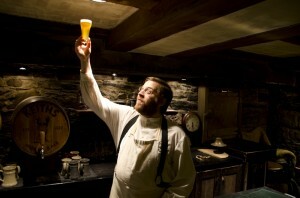 The beer features a deep golden color with a balanced bitterness. •Nova Scotia Style Brown Ale is a classic full-bodied brown ale, with hints of honey and caramel balanced with a fresh hop aroma provided by the addition of cascade hops. •All three beers contains 5.4 percent alcohol by volume. 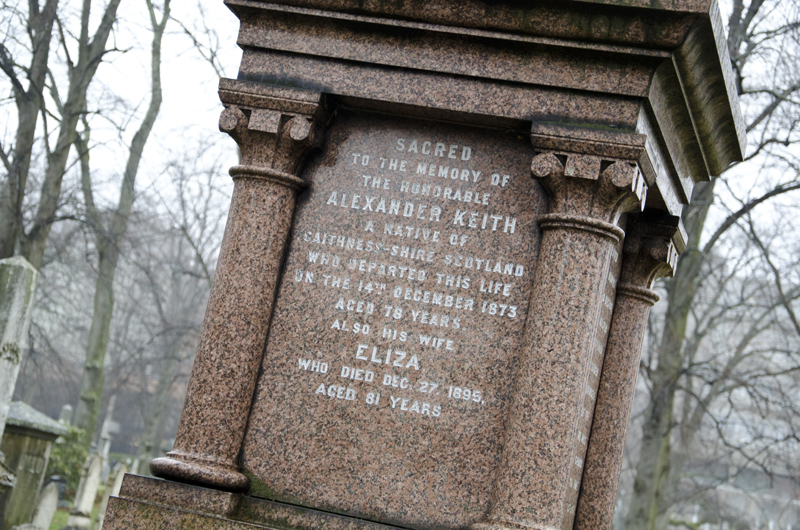 Most people in the USA probably won’t recognize the name but Keith Alexander is a popular name in Canada, not only because the beer is now Canada-wide but because he arrived in Nova Scotia to partner with the local brewery eventually buying it out in 1820 and creating the Alexander Keith Brewing Company. 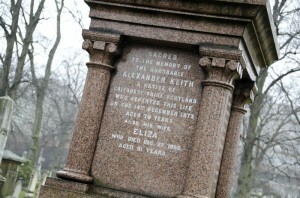 Keith was also Mayor of the city 3 times and was revered as a brewer, family man and kind person. It’s no wonder his birthday is now a great city-wide celebration. We’ve been on lots of brewery tours and usually they all tend to be the same. This time the tour of the historic brewery was more of a Disney-like adventure. Actors are hired and bring you back to the era of Mr. Keith. You get to see some of the old brewery and tools used as they sing and dance around you and encourage participation. While some may find this a little strange, it does break out of the normal tour. We eventually got into the tour, but most of us think a beer or two to warm you up to the entertainment might make it easier for all to feel comfortable. Of course there are samples to be had while you learn about the history and the beer. The tours run every 30 minutes in the summer with 15 actors dealing with the crowds. We’ll rank this as one of the more fun tours we’ve done. The historic brewery is a functional brewery, but not in use. The modern brewery is less than a mile away and it boasts state-of-the-art brewing that allows Alexander Keith to brew world class beer that is consistent. 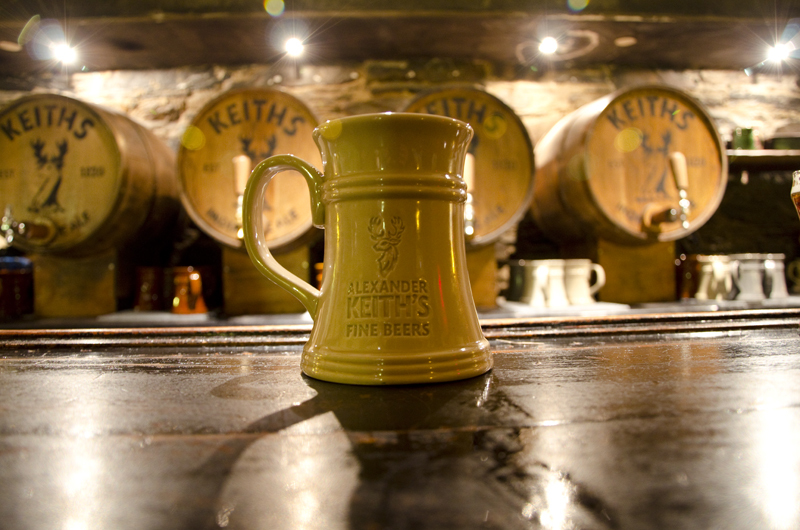 The brewery itself is capable of brewing enough barrels of beer a year for the area and can supply lots of Keith fans with their brew, but to supply the 22 states in the US, sister breweries are setup to brew the beer so they taste the same wherever they are brewed. To achieve this samples are flown in for a tasting panel and each beer is compared blind to the original. 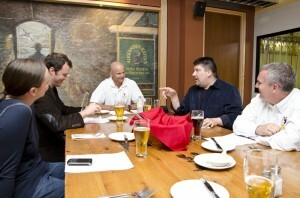 Our tour of Nova Scotia also included a beer dinner for our small group at the Beer Institute. This small training facility sits above a local pub and the chef prepared a wonderful multi-course meals all using one of Alexander Keith’s beers in the recipe. The dinner was amazing and the company made the enter night even more memorable. Traveling can be expensive, but having little parts of foreign countries coming to you in the form of food, or in this case beer can transport you to a far away place. Do yourself a favor and grab a Keith’s and see if you like the beer. Traveling to the far east of Canada might not be in your budget right now, but if you like good beer, friendly Canadian culture it might be a place you want to visit.